Google has gotten very good at finding exactly what we want, from the latest on today's biggest news stories to answers for our most esoteric questions. But Google has long moved past offering us just a list of links that may or may not be what we're looking for. If you fire up Google right now and search for a recent movie, you'll see local showtimes, the latest news, the rating and length, scores and review snippets, all before you get into that list of search results. That's Google trying to give you exactly the information you want, even if you haven't been very specific about what you want. 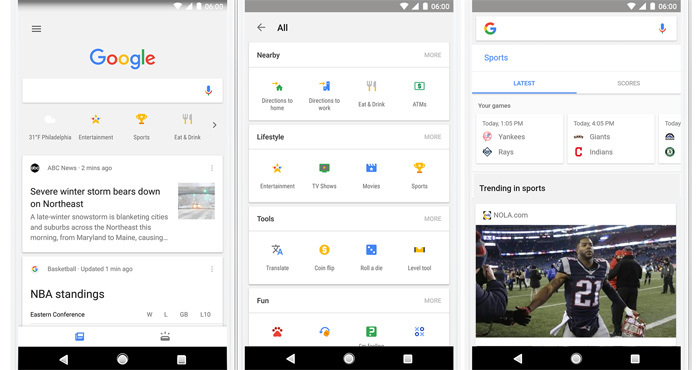 Google's new mobile Shortcut feature aims to fix that problem with a magazine-style interface where you can quickly scroll through information on popular topics. Starting today, searching in the Google app (for Android and iOS) or mobile web browser (Chrome and Safari) will show a slightly different Google. Just under the search box you'll see shortcuts for entertainment, sports and dining—though Android users will get some special shortcuts, like a tip calculator and currency converter. Each Shortcut takes you to a sleekly designed interface that lets you easily find just what you're looking for. Click to the TV tab under entertainment and you'll see a rundown of what's on tonight and a selection of shows you might like. The movies tab is similar, offering suggestions as well as a rundown of what's in theaters. Clicking on a show or movie will bring up all the details, with pictures, trailers, a summary and cast list. The content is front and center: all of this is above the standard list of search results. Similarly, the sports tab brings up game times, scores, and team news—and, of course, you can customize it to show info on your favorite teams. Dining is all about restaurant recommendations, suggesting places based on time of day, cuisine type, or where you are. These recommendations tap into Google's existing reviews, and depending on how well it works it could replace our mainstay dining app Yelp. You don't need to do anything to get these features. Just fire up Google search on your mobile device, either using your browser or the Google app. Shortcuts will show up immediately: all you need to do is click.